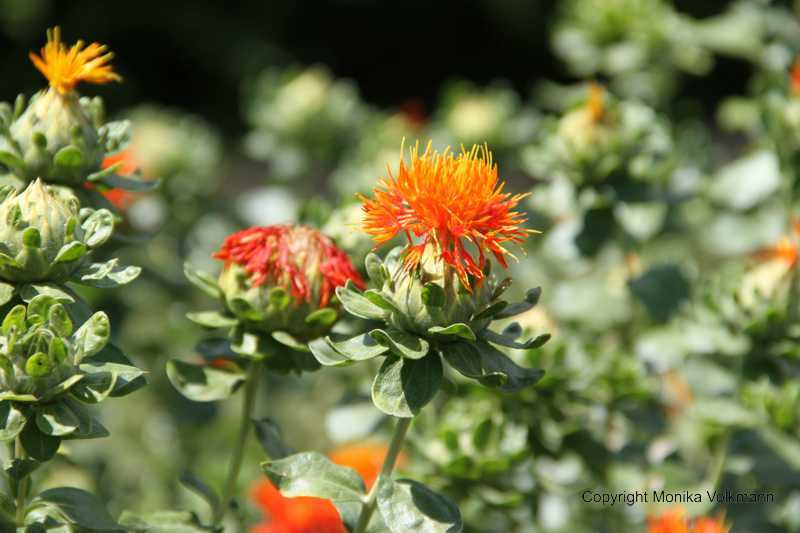 Safflower (Carthamus tinctorius) is commercially cultivated for vegetable oil extracted from the seeds. Safflower seed oil is flavorless and colorless, and nutritionally similar to sunflower oil. In a 16-week study with post-menopausal and obese women, the effects of taking conjugated linoleic acid (CLA, an agent promoted for weight loss) and safflower oil were compared. It was found that supplementation with CLA reduced body mass index (BMI) (P = 0.0022) and total fat mass (P = 0.0187) without altering lean mass. However, its effects were detected after 8 weeks of supplementation. Whereas Safflower oil had no effect on BMI but it did reduce belly fat (P = 0.0422) and increased lean mass (P = 0.0432). This is a promising study but it may be to early, and more studies should be done, before you start using Safflower Oil as a fat burner. Carthamus tinctorius is used in some testosterone boosters, probably because of its possible 5-aplha reductase inhibition properties. Kumar, Naphatsorn, et al. tested seventeen Thai plants, traditionally used for hair treatment, in order to define possible 5α-reductase enzyme inhibition and hair growth promoting activities. The study concluded that Carthamus tinctorius is the most potent 5α-reductase inhibitor and hair growth promoter followed by Phyllanthus emblica L. The least potent 5α-reductase inhibitor was Rhinacanthus nasutus (L.) Kurz. Mice receiving Carthamus tinctorius had more hair follicles than mice receiving other extracts. Norris, Leigh E., et al. “Comparison of dietary conjugated linoleic acid with safflower oil on body composition in obese postmenopausal women with type 2 diabetes mellitus.” The American journal of clinical nutrition 90.3 (2009): 468-476. Kumar, Naphatsorn, et al. “5α-reductase inhibition and hair growth promotion of some Thai plants traditionally used for hair treatment.” Journal of Ethnopharmacology (2011).